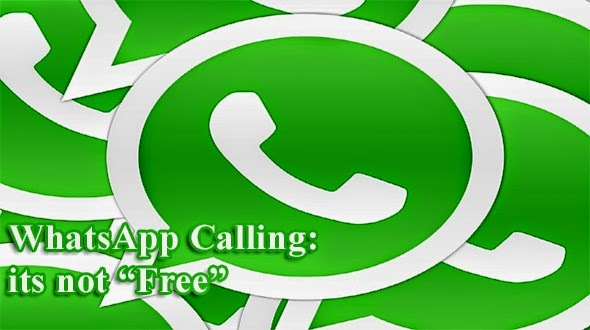 WhatsApp Calling its not "free"
While talking theoretically WhatsApp calling feature is free, but it’s not free. According to research done by AndroidPit, sometime WhatsApp calling is more expensive than the normal calls. Today, in this article, we will see how WhatsApp is not free and how much burden it creates on your pocket. The test now reveals that calls made via WhatsApp use 1.3 MB of data per minute on LTE. However, this number could vary and go as low as 600 KB per minute. This means the monthly pack of 500 MB data will vanish in 6 hours. When we see the average cost for these 500 MB packs is almost around 150/- INR, means you pay 25/- INR per hour and 0.42 P INR per minute and which is again paid by both sides of the call, which means it is almost 0.80 P INR per minute, while on traditional call you might be charged with some 0.10 P to 0.50 P INR per minute, depending on your talk plan. When it can be free? So, with all the data above, does it means that WhatsApp calling is not free? My answer will be no. With some terms and condition it can be free. Let’s see how? Scenario 1: If you have Wi-Fi installed at home with unlimited plan, than WhatsApp calling is free. Yes, when you have unlimited bandwidth with fixed price which is anyways getting charged to you then adding a feature in it will always be free. Scenario 2: WhatsApp calling can be free in one more way, if you have unlimited bandwidth with your service provider. Yes, if you are paying for the unlimited bandwidth to your ISP, then using it to the extent is your right and in that way it will be free, as it will not cost anything extra on your pocket. Hope you have enjoyed the post, do share your views and comment below. You can also subscribe to App Gyaan Rss Feed for all the live updates directly into your mail box.